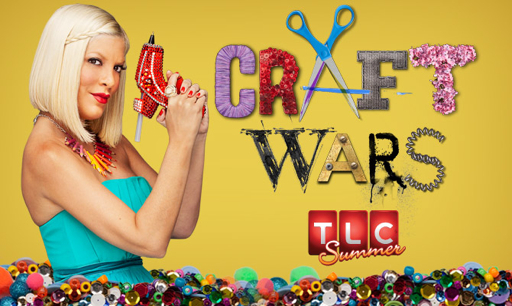 Liddy B. and me: Craft Wars is Coming SOON! Craft Wars is Coming SOON! 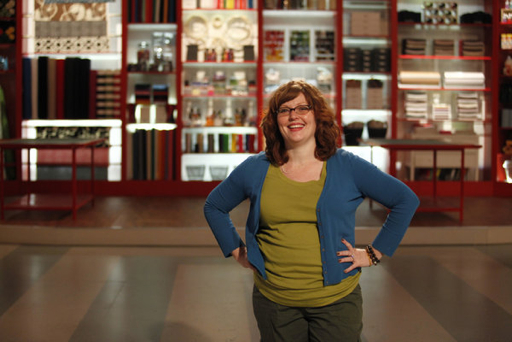 OK, I'm starting to get pretty excited about Tuesday's Craft Wars premier!! TLC seems to be ramping up the excitement as well and a whole bunch of new photos and videos are popping up on the Internet. Seriously, how cute is Tori Spelling in this picture?!? It looks like a Craft Wars PARTY! We will see if I still think Tori is adorable after watching the show and hearing all the things the judges were saying about us while we were so busy with our crafting! Speaking of which, here are some random still shots of Team Burchett working away on the show. Some of these are on TLCs website here and some of these popped up on some random website here. And here is a dorky looking picture of me looking dorky! We had to pose for a few photos for the opening of the show and this is one of the posed shots. I hope they aren't using this one! I also hope that I look pregnant and not just fat! Lets talk about what i do live about that picture. I am standing in front of the Michael's Craft Closet and that thing is GORGEOUS! Here is a long shot of the whole thing. I think it might be my favorite part of the show. Being able to grab and use ANY supply without worry about cost or wrangling kids and driving to the store! Want to see more than just STILL photos? 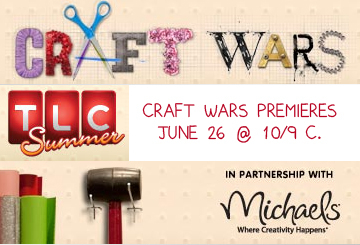 TLC now has FOUR craft Wars videos up on their website. You can get to links for all four videos by clicking here. "Introducing Craft Wars" is the original 30 second promo. 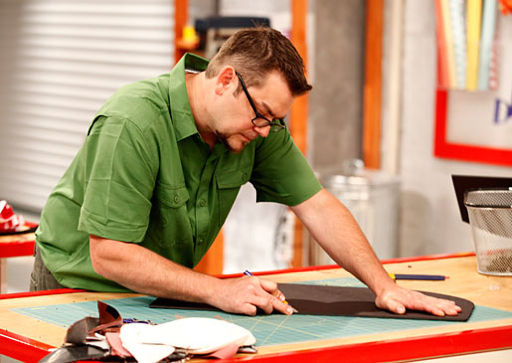 "This is Craft Wars" is a longer look at just the first episode, our episode! "Spray Glue is an Issue" is focused mostly on my issues with sewing over glue. I cry...and curse... MULTIPLE times....and it's not THAT long of a video! The last video "On the Craft Battleground" is another general promo. I don't think you see Team Burchett much, but if you ate enjoying the advanced details, it's a fun glimpse at the show! Want to see more than just video? PJ and I will be meeting up with friends and family at Latitude 35 to watch the show. We will arrive around 8 or 8:30 to hang out, eat, and drink before the show starts at 10. Let the Craft Wars BEGIN! I Found Pictures....And My People! FINAL Super Why Giveaway Posy! Family Pics at Nick's in the Sticks! Birthday Outfit Done and Re-done!